A lavish dinner in the opulent setting of the Felsenreitschul theater in Salzburg on Wednesday evening failed to smooth the way. By Thursday, there wasn’t much left but bitterness and rancour. Donald Tusk, President of the European Council, said key aspects of Brexit proposals presented by May “will not work” in their current form. Angela Merkel, the German Chancellor, said there could be “no compromise” on the integrity of the single market, the bloc’s economic free-trade zone. Emmanuel Macron, the French President, was harshest of all. The entire Brexit project was sold to the British people by “liars” who immediately fled the stage, unwilling to see their project through. May could be forgiven for looking like thunder at her post-summit press conference. But she showed no sign of backing down from the proposals hashed out with her Cabinet at her country retreat of Chequers in July — so controversial with her own party that they provoked the resignation of her foreign secretary, Boris Johnson, and Brexit secretary, David Davis. 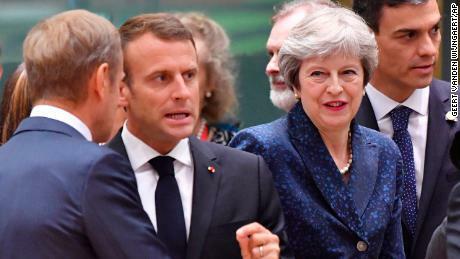 She acknowledged that a bilateral meeting with Tusk was “frank.” But Chequers was the only game in town, she told reporters. That plan “remains the only serious and credible proposition on the table,” she said. If the language coming out of EU leaders was anything to go by, the prospect the UK crashing out without a deal seems greater than ever. “Everybody shared the view that while there are positive elements in the Chequers proposal for economic cooperation, the suggested framework will not work — not least because it risks undermining the single market,” Tusk told reporters. The main sticking point continues to be how to handle the border between Northern Ireland, which will remain part of the UK, and the Republic of Ireland, which will continue to be part of the EU. Neither side wants an arrangement that would require the rebuilding of border infrastructure, the removal of which was a key part of the Good Friday Agreement that brought peace to Northern Ireland after years of sectarian strife. 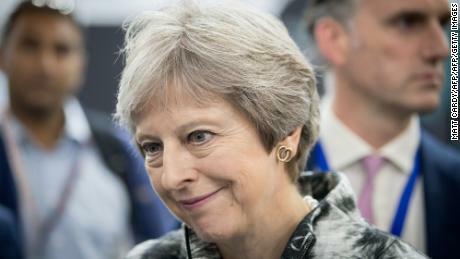 May promised to bring forward new proposals that would ensure trade could move freely across the Irish border, but would not require different customs regimes in Northern Ireland and the rest of the UK, a key red line for the British Prime Minister. EU leaders will meet again at a formal summit in October, which Tusk called “the moment of truth” for Brexit negotiations. Under the EU process that governs Britain’s withdrawal, the UK leaves the bloc on March 29, 2019 — deal or no deal. In practice, to allow for parliamentary ratification, that means a deal must be struck in the next couple of months. It’s clear that significant gaps remain between both sides. “The Irish question needs something more than only good intentions,” Tusk said. “Without clear a precise solution to the Irish question, and for the whole context of our economic future relations, it will be difficult even to imagine a positive process after October,” Tusk said. The sour tone at the end of the Salzburg summit could all just be part of the negotiations dance. Both sides want to show a tough face. May faces a rough ride at the Conservative party conference in a few weeks, with challengers to her leadership waiting in the wings. And EU leaders want to make an example of the UK’s pain to any other countries even thinking of leaving: Breaking up is hard to do.